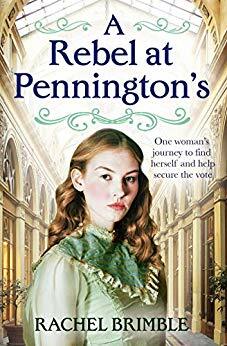 Esther Stanbury is Elizabeth Pennington's friend, and the head window dresser at Bath's premier retail store, Pennington's, founded by Elizabeth's now-retired father. Elizabeth and her husband, Joseph Carter, have revived the store's image and future, and Esther's skills have been important to that. Her other passion, though, is the suffragist movement. Raised as a suffragist by her mother, despite the objections of her father, the movement has split her from her father after her mother's death and her father's remarriage. She invests much of her off-work time and talents to promoting the cause, and, growing a little discouraged, is watching the growth of a more violent movement with concern. At this point, she meets Lawrence Culford, standing outside Pennington's with his daughter, Rose, and his son, Nathaniel. Rose wants a cricket set; Lawrence is suggesting a doll. Esther plunges into the discussion. Lawrence, it turns out, is a supporter of the suffragist movement, and truth be told, intended to let Rose talk him into the cricket set, not that he tells Esther that. They're both damaged people, hurt badly by their parents, and Lawrence and Esther both each blame themselves. Widowed Lawrence wants a woman he can really love, not a pleasant but loveless marriage of convenience as his first was. But with two motherless children, he thinks he has a duty to find, not the intelligent, independent woman he dreams of, but a dedicated mother for his children, who will make them her priority. Esther has learned from her father's change from loving parent to a man who ultimately forced her to move out or give up every shred of independent though and action, that she's not really worthy of love and can't trust any man to love her anyway. There's a lot going on here, and not just with Lawrence and Esther. There's more growth, more development of characters we know and characters we're just meeting. Brimble has done her research, and as far as I can tell has done an excellent job portraying England in 1911, with the coronation of King George V approaching, The Great War still a future threat not yet troubling the average person, and the Women's Suffrage movement a contentious and sometimes violent current reality that would not succeed until 1918. I liked the first book, The Mistress of Pennington's, but I do think this one is even stronger.